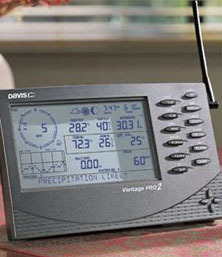 The weather station is a wireless Davis Vantage Pro2. 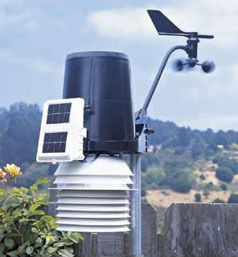 It logs temperature inside and outside, humidity inside and outside, wind direction, wind speed and barometric pressure. The outside temperature- and humidity sensors are equipped with a day-time fan to avoid that warm, still standing air give false readings. The rain collector is heated. It means that precipitation in form of snow and sleet is melted and measured. The outside sensors have a wireless communication with the console inside. The data is transfered every few seconds. The information from the sensors are logged by the console and is continously transfered to the PC by Davis WeatherLink. The logger has room for about one day of logging, so if the electricity stops and the PC goes down, it will get all the information from the time that it was down when it is back up running again. The console and the logger have battery backup. On the PC I use Weather Display to get the data from the logger, do computations, save the data on the PC and transfer them to the web server. Data is transfered to the web server each 30. second. It means that you can see changes in weather each 30. second on the main page.